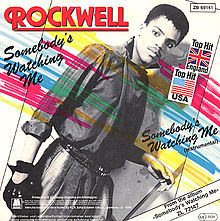 Gen Xtinct: Music Week: 1984 -- "Somebody's Watching Me"
"I always feel like...somebody's WATCHing me," sang Rockwell back in 1984. Well, no wonder, buddy -- your dad is Motown mogul Berry Gordy, and you scored background vocals by the most famous man in the world, Michael Jackson. You're not exactly going to be flying under the radar. Still, while people may have been watching him, after this song, they weren't really listening anymore. As catchy as this tune was, he scored only one more Top 40 follow-up hit, "Obscene Phone Caller." Check out this Wikipedia entry for more information about this one- (OK, two-) hit wonder. The very best nugget? The record label was who suggested changing his name from Kennedy William Gordy to Rockwell. Rockwell went for it, because he reportedly believed he "rocked well." Remember this spooky haunted house video, with Mr. Well in the shower, Psycho-style? It's gotten 4.4 MILLION hits on YouTube. Go figure. He was right -- and people are watching him, still.